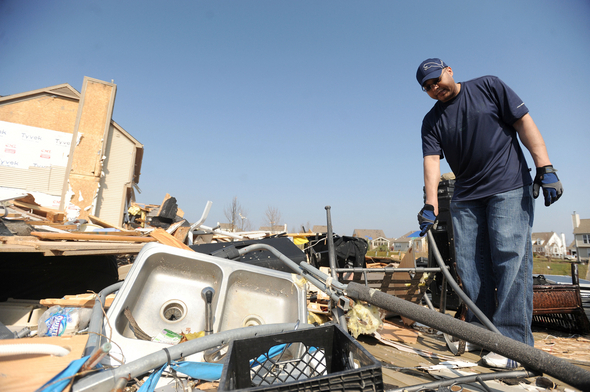 Posted on Fri, Mar 16, 2012 : 2:59 p.m.
Mechial White sifts through the remains of his house, which was destroyed Thursday when a tornado tore through Dexter. Mechial White removed a long, rectangular silver box from the rubble at 7158 Wilson St. in Dexter where his home and music studio stood less than 24 hours ago. He swung the box down onto what remained of his backyard deck, knelt and flipped open the box. “Aww, no,” he said, rocking back on his heels in defeat. “Man!” he said. More damage. 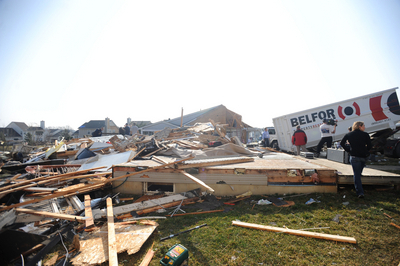 The turntable inside the case White uses for disc jockeying, and virtually all of the contents of his two-story home, did not survive the tornado that swept through the village of Dexter at about 5:30 p.m. Thursday. White’s house was flattened in the storm, which brought inch-diameter hail and winds in excess of 130 mph. A jazz musician, international DJ and music producer, White — also known as "The Groovematist" — had at least $100,000 in music equipment at his home. He had a full, two-story recording studio for local bands and artists to use. He also recorded his first album, “Grooveology,” there and was working on his second album. “These were my babies right here,” White said on Friday afternoon, patting a large upright speaker that had been damaged in the storm. The remains of Mechial White's home in Huron Farms subdivision. White’s garage was destroyed, and an empty equipment trailer that was parked inside flew about 30 feet and landed on the side of White’s yard near the back of his house. His Jeep, which was parked in the garage next to the trailer, however, stayed in its place. The most important thing — aside from White making it out alive — was he was able to rescue his computer hard drive with the music for his new album on it from the debris. He also saved a guitar and found his wallet. White was hiding out in his basement Thursday night as his home collapsed around him. White said that’s when he knew he had to get out. He headed up the stairs and found the doorway blocked but was able to crawl out unharmed into the open air. Despite traveling to foreign countries where natural disasters and extreme weather are more common, White said he has never experienced anything like Thursday in his life. “This is the stuff you see on TV and in the movies,” he said. Because his equipment has been destroyed, White will begin contacting other DJs to cover his gigs for him until the insurance checks start coming and he can replace what was lost, he said. Sat, Mar 17, 2012 : 12:38 p.m.
Our prayers are with you. You did a wonderful job at our daughter's wedding 4 years ago, and I know you will recover and do many more. Fri, Mar 16, 2012 : 8:23 p.m.
Mechial - so sorry for your loss. But so glad you are safe. We've attended many school dances that you've dj'd and you're an asset to this community. You are in our thoughts and prayers as you rebuild your home and studio. Fri, Mar 16, 2012 : 7:38 p.m.
Mr White? Those are things. Your life is precious. I would be giving thanks that I walked from this aftermath. As for the jeep? No surprise there. Jeeps are made to last. Good luck rebuilding and replacing. At least you have your life. Something that cannot be replaced. Mon, Mar 19, 2012 : 2:56 a.m. I was there when this man was looking through the remains of his home. He was certainly not complaining. jns131, I imagine you are trying your best to say something profound, but unless you have walked in his shoes or those that live on his street, you have no idea. Sat, Mar 17, 2012 : 7:23 p.m.
Yeah. What an ungrateful complainer this guy is. Only lost his house, place of business, and the tools of his trade and sits around whining. Are you for real jns131? Unbelievable. Sat, Mar 17, 2012 : 2:49 p.m.
What I have noticed is this world is so material it is not funny. If our house burned to the ground? I would be giving thanks that at least the thing is insured and I can rebuild from it. Ashes to ashes and the Phoenix rises again. Sorry, but I am not a material girl in a material world. Try living like an Amish without possessions. Can be done. Try living out for a few weeks camping. Can be done. Fri, Mar 16, 2012 : 7:55 p.m.
Easy to say that, but what is life without one's possessions, which are also tied to memories (photos, music, artifacts, etc). Yes, health is the most important thing, but seeing all your belongings and memories utterly destroyed is devastating.